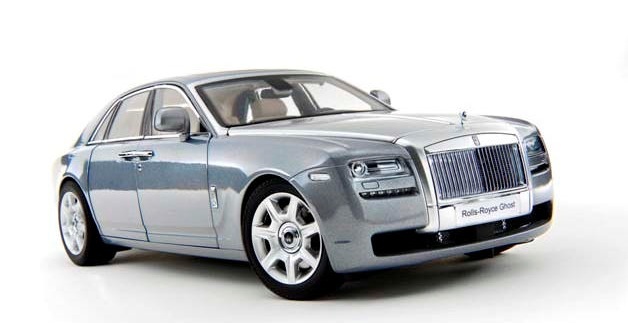 The Kyosho Rolls Royce Ghost is one of the most anticipated diecast models. Let’s take a quick look at what will great you when you get the model out of the box. First the exterior. The model will be offered in two colors – silver and black. Both have bonnets colored to mimic bare aluminum. As usual with Kyosho the quality is quite high. And this model is in the new premium line which has quite a high price tag. But you do know you’re going to get great quality. First are the doors which open in true to the real car fashion. Then it’s the panel gaps which are amazingly good. The only slight disappointment is the hinges on the bonnet, which are dog-legs. 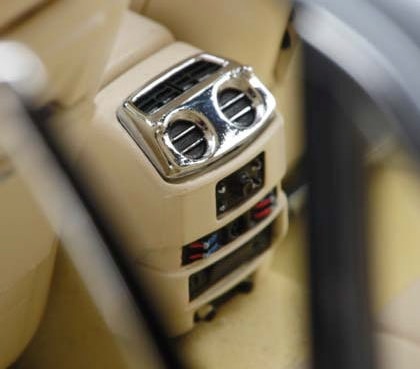 The engine itself is beautifully crafted and packs as much detail as possible for what it is able for the owner to see. 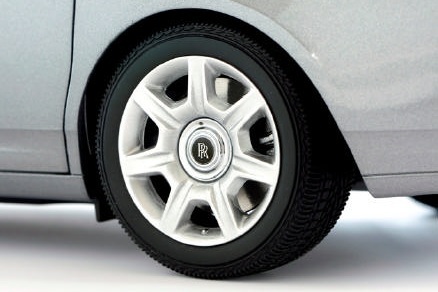 Other amazing parts from the exterior are the fixed wheel nuts with the Rolls-Royce logo which don’t rotate but the actual wheels do. The quality of the headlights is also quite amazing. There are even little Rolls-Royce logos engraved in the glass. The quality in the interior gets even more amazing. 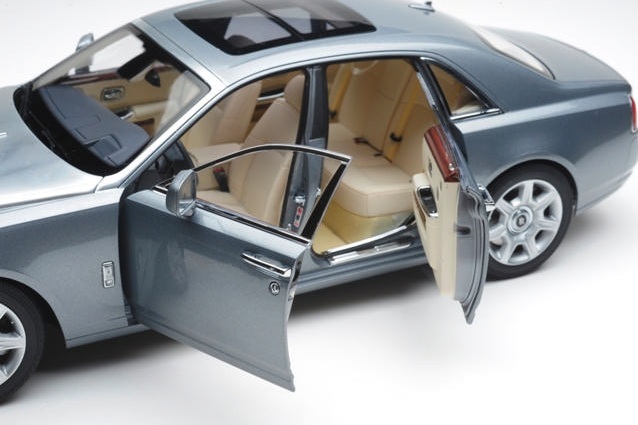 There is a slidable roof-shade, opening center console and even opening trays on the back of the front seats. Here is also an opening control unit between the back seats. Want more? There is a little umbrella hidden in a special slot in the front left door. 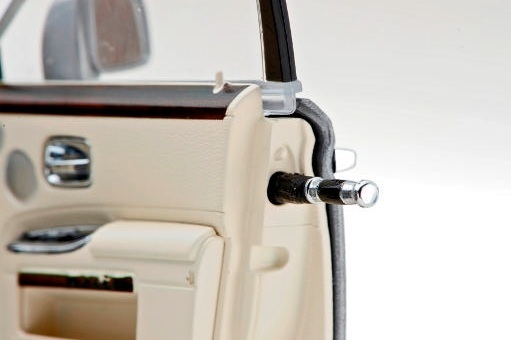 While we’re at it, the door panels and locks are of amazing quality as well. 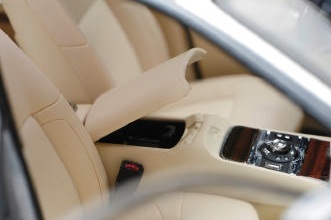 The quality of the dashboard is also Rolls-Royce-like. The walnut trim, the steering wheel, completed with small buttons and much more. Of course there’s a lot more details and subtle touches but Kyosho plans on saving them for later. For now the preview is worth it and surely gets us pumped up for the time when the model will be released. 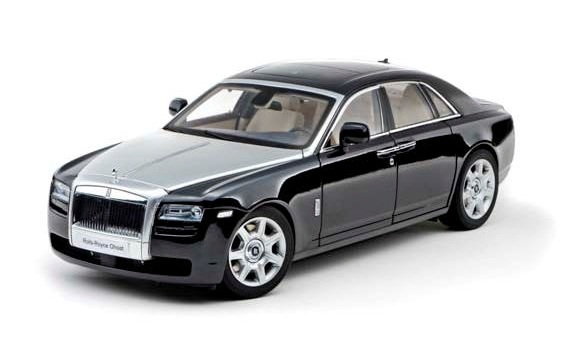 The Kyosho Rolls Royce Ghost has the potential to be one of the best models for a while. You can preorder it right now from several online stores.